My children’s book Shadowville is currently featured in an exhibition at London Print Studio, an artist-run non-profit organization that offers professional printmaking resources and runs projects in London and beyond. 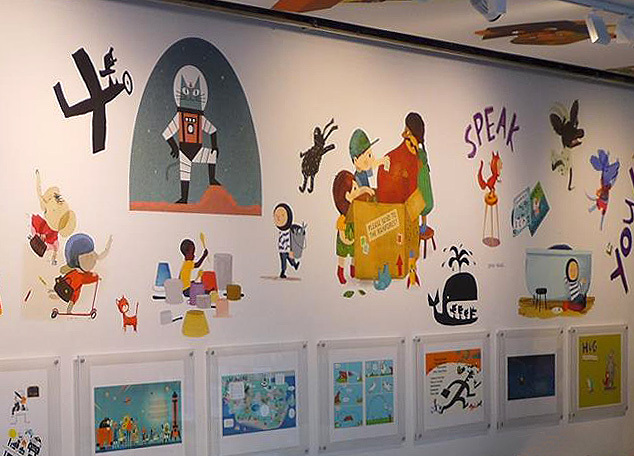 The show, titled The Enchanted Page: An Exhibition of Children’s Illustration, features framed book spreads and large-scale image excerpts on the wall. At the same time, the gallery offers visitors the opportunity to read, draw, play and explore a selection of picture books. Curated and designed by children’s book illustrator Frann Preston-Gannon and LPS Director John Phillips, the exhibition features work by fifteen children’s book authors and illustrators including Julie Morstad, one of my personal favorites. According to Mr. Phillips, the show has been well received and may likely be booked for display in several art spaces outside London. The LPS will also be running workshops with local schools early next year in conjunction with Enchanted Page artists. The exhibition runs through the end of January 2015 during which artist’s talks, guided tours, and workshops are available for visitors. London Print Studio is located at 425 Harrow Road, London W10 4RE / tel 020 8969 3247. Their gallery page is here.